To learn more about our architecture and interior design services, connect with us on social media or email us at info@gdg-architects.com. GROTH Design Group is looking for talented employees to join our growing family. If you are excited to work in a collaborative environment, deliver architectural services across many sectors and support our motto of LISTEN|LEAD|SERVE, please see our current openings. If you are looking to learn from design experts, grow your hands-on experience and be a part of projects that matter, explore an internship with GROTH Design Group. If you have a minimum two years in a School of Architecture program, send your cover letter, resume and representative work samples to info@gdg-architects.com. Staff gets together several times a year for a special employee meeting called a Groth Spurt. GROTH Design Group celebrates MLB Opening Day 2018. This sharply-dressed crew of GDG’ers attended a private school dedication. GDG’s Cedarburg office celebrates MLB Opening Day 2019. GROTH Design Group's 2018 summer picnic. GDG’s Milwaukee office celebrates MLB Opening Day 2019. 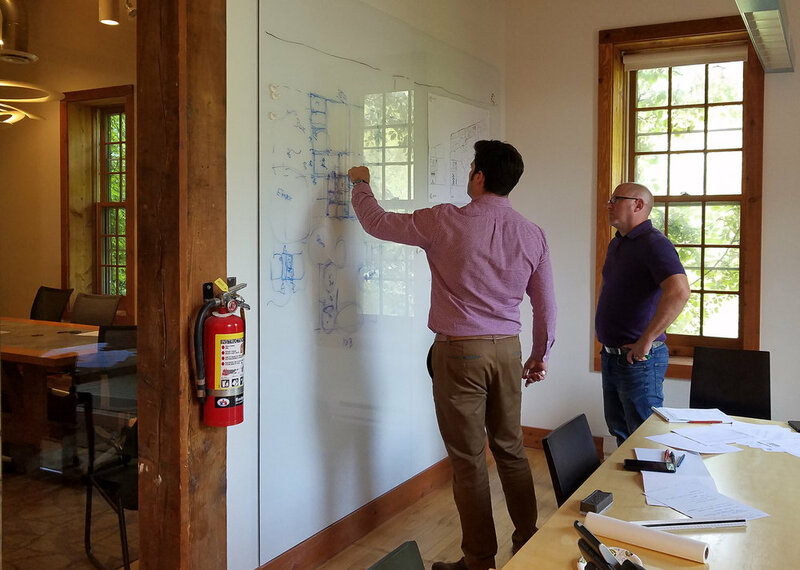 Peter (Director of Design) and Dan (Architect) collaborate to serve our clients.